It took Rowyn a moment to realize that the rapid tormented breathing he heard was his own. His chest pounded; his heart felt like it was being forged on a blacksmith’s anvil. He breathed deeply until the pounding lessened, then rolled over and pulled the blanket up over his shoulder. An instant later he rolled back to the other side. He yanked the blanket – it sounded like the crack of a branch snapping. Twisting onto his back, his eyes opened. He stared at the wood beams of the ceiling. Something tugged at his mind, but it wouldn’t manifest itself. Turning his head from side-to-side, he scanned the room and realized he did not recognize any of the furnishings. The walls were bare, the wood darkened as if burnt. The exact release date for Betrayal of the Covenant is still being negotiated, but will be announced here when finalized. 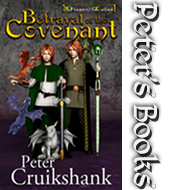 Several readers have told me they planned to read Fire of the Covenant again before Betrayal came out, to reacquaint themselves with the characters. Others planned to just read the last part of Fire. If only reading part of the book, I would suggest picking up at Chapter 50 – it would still require you to read over 100 pages, but much less than the 500+ pages of the entire book. 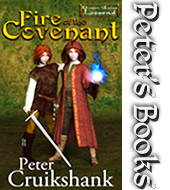 If you have not read Fire of the Covenant, now is the time to get your copy. The Kindle and Nook versions have been reduced to $3.99. The paperback is available on Amazon or Barnes & Noble – alternatively an autographed copy can be purchased from il fennore publishing. Description: Tracked by minions of the evil Shin-il priests, the Dragon-Called Twins, Rowyn and Willoe, journey on a quest to the Hoarfrost Mountains. Lands rife with dangers, including savage Sköll Wolves and the fearsome Ice Giants. Mountains that may hide more than just the sought-after Sword and the Staff, devices created by dragons and rumored to control the Others and their Fire Within, while preventing one of the twins from dying to satisfy the Covenant. Back at Westhedge, unrest stirs as it becomes clear that a newly self-crowned king, and his mentor that controls the throne, will do whatever is necessary to keep their tenuous hold on the Kingdom of Cainwen, the Twins homeland.